what I will be writing about today. I have a streak going that I don’t want to break, so I’ll just start typing and see what happens. I mentioned in the little biography blurb that I have a wee bit of a Lego problem. It’s true. I’m fascinated by those little plastic bricks. Growing up, we didn’t have a lot of money, but the few Legos I had were very well-used. I spent a lot of time building spaceships of my own design, knowing then that since there’s vacuum in space, my ships could be very rectangular. Well, that and there weren’t a lot of round pieces back in the dark ages. Fast forward to December 2011, we were visiting the Lego Imagination Center in Orlando at Downtown Disney. I was taken by the sheer number of choices available. Being as I like Star Wars, I was checking out some of the Lego Star Wars sets, lusting after the Super Star Destroyer that cost $400, things like that, when I saw the AT-AT. To quote my friend Jed, “I’m generally very pro-AT-AT.” I thought it would be a great set to build after being out of the Lego game for 20 years. It was only about 815 pieces, reasonably priced as such things go, and the last one they had. I bought it, then realized I had a problem. How the heck would I get it on the plane? This was a pretty big box and The Management and I were only travelling with carry-on bags. Luckily, a friend of ours we would be seeing at New Years was travelling via Auto Train and was willing to take the AT-AT home for us. It was sad, though… I had to wait another three weeks to build it. Or even to see it again. Sniffle. So, December 30, The Management and I headed to scenic Glenside, PA, to take in a Cinematic Titanicdouble feature featuring two of the worst movies I’ve ever seen. One was called Astral Factor. Starring Robert Foxworth and a pantsless Stefanie Powers, well, it’s as bad as you might think it would be. The other was called Frankenstein’s Castle of Freaks, and that was even worse. 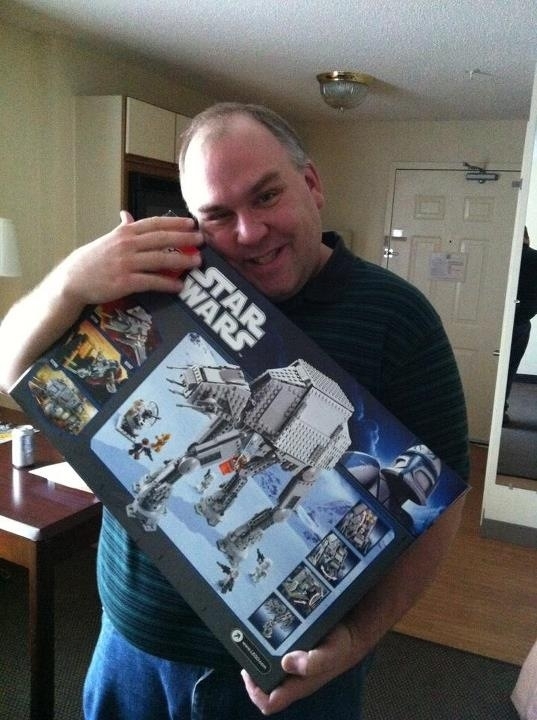 All that is beside the point… I was finally reunited with the AT-AT. I was rather happy about this, as you can probably tell from the picture. The next day, I was able to start construction. It came back to me and I was again struck by the attention to detail. This even had movable legs and a General Veers minifig! I started understanding why the sets were so expensive and just how much detail goes into them. After watching me build that, The Management decided she wanted to join the fun and we managed to pick up a model of Frank Lloyd Wright’s Fallingwater, from the Lego Architecture Series. Lego Architecture takes some of the world’s landmarks and renders them in Lego bricks… some results are better than others. I consider Fallingwater to be an amazing rendering, whereas the Sydney Opera House was a dud, IMHO. Anyways, she built that in one night and our family addiction was born. Currently, the Nerd Lair is populated by many of the sets from the Original Trilogy films. There’s a TIE Fighter, X-Wing, Y-Wing and the Millennium Falcon. On the bar is one exception, an Ultimate Collectors Series version of Obi-Wan’s Jedi Starfighter. 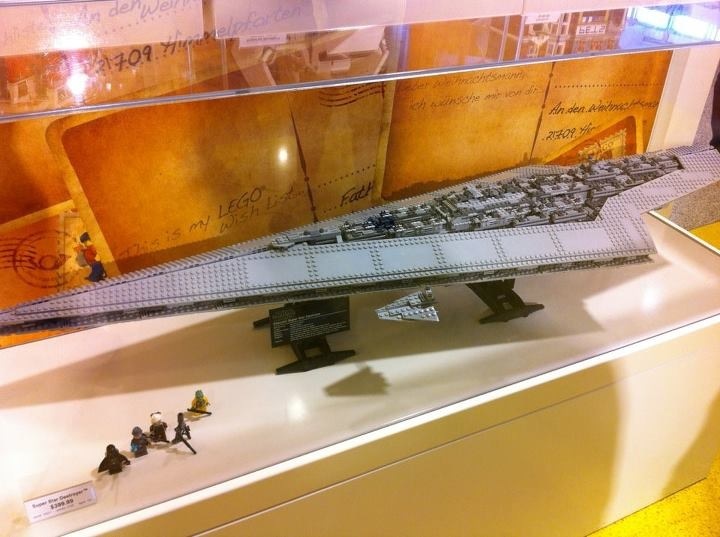 Also on the bar is my birthday present… an Ultimate Collectors Series Imperial Shuttle. That took me nearly a week to complete, but it was certainly worth it. In short, Legos were a big part of my childhood and one I’m very glad I’ve not only been able to rediscover, but one that I’ve been able to share with The Management. Her next build is in the house… an Architecture Series rendition of the Robie House. We’ll see how it goes. Hope you all have a great weekend and can treat yourselves well. I have a regular doctor’s appointment on Monday. Hope I’ll be able to report a few pounds lost.